The Go-Lite Bariatric Steel Rollator from Drive Medical is a heavy duty 4 wheeled rollator with a 500 pound weight capacity. It is blue in color. 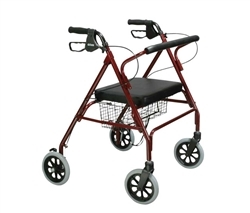 The Go Lite Bariatric Rollator features 8” caster wheels with soft-grip tires for indoor or outdoor use. It has special loop lock bicycle style brakes made of internal aluminum casting that operate easily to ensure safety. It features a soft padded oversized seat and comes with a large basket that can be mounted under the seat. The basket measures 21” wide x 6” high x 9” deep. It also has a tool-free removable padded backrest for added comfort. The handles are easily adjustable in hight with a self threading knob. The Go-Lite Rollator is available in blue only. Red is shown in the image for illustrative purposes only.